Rhys Turton is the creative mind behind the video game and pop culture cross stitch brand Lord Libidan. A regular contributor to books, kits, craft magazines and blogs, he’s moved into producing his own books and kits. Born out of a need to shed the antiquated Granny perception of cross stitch and bring it into the 21st century with video game and pop culture designs. Crafting just got a whole lot cuter. 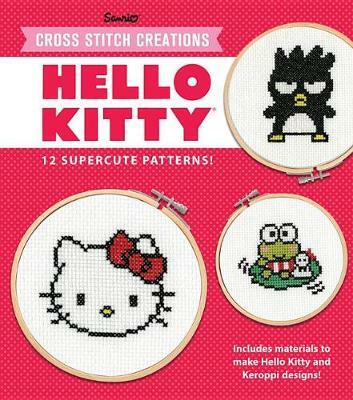 Like Hello Kitty herself, the twelve patterns in this fun, accessible, cross-stitch kit are all simply adorable.Cross Stitch Creations: Hello Kitty includes a fully illustrated book with step-by-step instructions and photographs of the finished projects, plus fun notes and details about the characters of Hello Kitty’s world. Stitch 12 iconic patterns from a galaxy far, far away! Bring a touch of the Force to your crafting with Star Wars Cross Stitch. Frame a memorable quote, embellish clothing with the logo, or add your favorite character to a throw pillow—get creative with patterns inspired by A New Hope to The Force Awakens. Whether you’re a beginning Padawan stitcher or a Jedi Master, you’re sure to find a pattern that fits your skills. Disney Classic Cross Stitch lets you add a touch of Disney magic to everyday items! From a sweet Winne the Pooh bib to a Steamboat Willie throw pillow to a lovely framed stitching of Cinderella’s Coach, these projects all feature beloved classic Disney characters. A contemporary fantasy novel about the friend of the prime minister who get enrolled in an odd situation, including death, a bunch of animals, a war of nations, a family tree (of sorts) and a wizard demanding an apology. Oh, and there’s a robot with an IQ of zero, who happens to also do all the thinking for Rusty, whiskey is now a hearty breakfast and the prime minister is a horse; just like normal really.